If you are trying to make the switch to 100% grass-fed beef or more accurately, pasture raised beef, and you love Mexican food, then this How to Make Grass-Fed Carne Asada instructional post is for you. 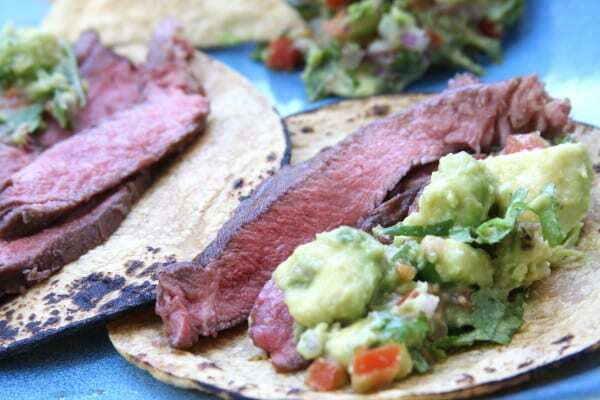 This recipe makes tender, juicy beef with Mexican flavors perfect for tacos or burritos. When I started eating 100% grass-fed pasture raised beef, I remember falling in love with the the hamburger. It had a rich, bold taste to it that was so satisfying. My husband was hit and miss about it. Some of the hamburger he loved and others he could not stand. When I ventured out to try the other cuts of 100% grass-fed beef, I wasn’t as excited and quite frankly, I was a bit grossed out. I found the texture of the other cuts to be gristly, completely different from what I was used to. I so badly wanted to love the pasture raised steaks and roasts because of their superior nutritional qualities. The only cut that I evenly remotely enjoyed was top sirloin and even that was chewier than I would like. After many hours of researching and grilling/cooking experiments I have learned a little bit about what to do and what not to do when cooking grass-fed beef. My horizons have been expanded and still are expanding in the world of eating pasture raised beef, and I am excited to share with you how to make grass-fed carne asada. Before getting into the how to’s, there are a few things to keep in mind. Where you buy your meats can make a huge difference in quality and there are some recent changes regarding the laws of the meats available to us at the grocery store. Many of us here in the US have had the luxury of being able to go to the grocery store and purchase grass-fed beef, based on the label on the package. We have also been fortunate enough to know what country our meat is from. Well that is changing. Not only has Congress recently repealed the country-of-origin meat labeling rule (1) (2) , in addition, the USDA will soon be withdrawing its standard for grass-fed beef labeling (3) (4). What does this mean for the consumer? Well it could mean that very soon the beef, pork, chicken, lamb etc. you are buying from your grocery store is coming from any possible country. Also, for anyone who relied on the USDA grass-fed label as a trusted means to know how your meat was grown, that will be gone. Without a trusted standardized definition of grass-fed meat there is bound to be massive consumer confusion and no guarantee that the beef you are eating is 100% grass-fed. So what is the antidote for the consumer just wanting to make sure they are purchasing meat from here in the states and wanting 100% grass-fed. I feel the answer is, know your farmer or know who you are buying from. I can not emphasis enough the amount of trust and confidence that comes from getting to know your local farmer and seeing first hand how they raise their animals. I remember how overwhelmed I felt when I first started in the direction of getting to know my farmer. The first hurdle was just simply trying to find a local farmer who I trusted that raised pasture meats. If you are in the place I was, sold on the health benefits of eating pasture raised meats and ready to make the transition, a great place to start is the directory Eat Wild. This site lists by state, pasture-based farms and those farms that ship. My personal experience with these farms is they are usually family owned and go above and beyond with customer service. They are a huge support when trying to make the switch and full of great ideas. Just know the transition is a process and you will most likely have ups and downs. You will find how you prepare the different cuts of beef can vary. It just takes time and patience to learn the new way of cooking. 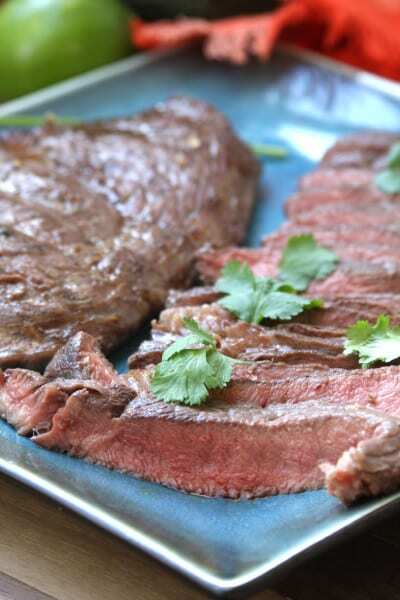 I went from being grossed out and discouraged to being able to write this how to make grass-fed carne asada. 1) Create a marinade that has a great balance of flavors. In my experience, staying away from salt and liquids that contain a high amount of salt helps the meat maintain its moisture. Fat, citrus (which will help tenderize the beef), garlic, beer and some form of heat is perfect for the marinade. 2) Let the beef marinade at room temperature for no less than 1 hour but ideally 2 hours. 3) Preheat the grill and cook over medium heat. This is a biggie to help prevent the meat from over cooking and drying out. If you absolutely love the grill marks, only turn on 1 of the burners of your grill to high, leaving the others off. Sear each side for 3 mins with the lid closed. Once seared, move to the side of the grill that the burner is turned off for the remainder of the cooking time with the lid shut. 4) Make sure not to poke or cut into the beef as valuable juices will be lost. 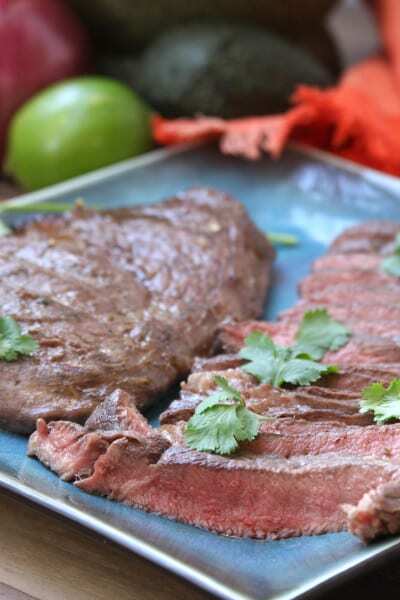 As you probably guessed, thats what keeps this carne asada juicy. 5) For medium-rare cook 7-9 minutes per side. 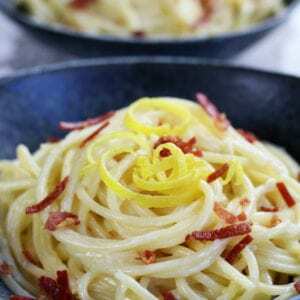 For medium cook 10-12 minutes. 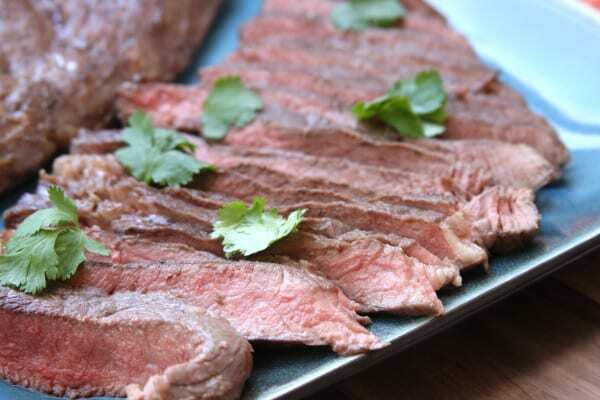 Hopefully this how to make grass-fed carne asada post brings you one step closer to enjoying pasture raised beef for your next Mexican feast. Mix together all ingredients for marinade is a large bowl. 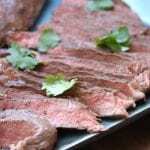 Place beef in a large glass casserole pan and pour marinade over beef. Marinade for no less than 1 hour, ideally 2 hours at room temperature. Once steak has marinated, preheat grill on medium heat. For medium-rare, grill with the lid closed 7-9 minutes per side. For medium, grill 10-12 minutes per side with the lid closed. *Since grills vary in heat, cooking times may vary. Once grilled, let rest on a platter for 10 minutes and then cut into stripes against the grain. Serve with tortillas, chips, guacamole or salsa.